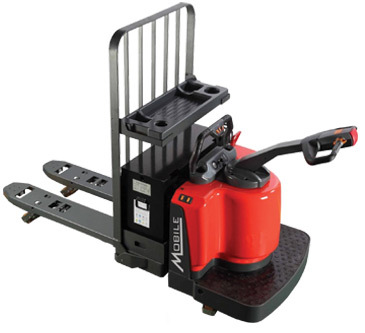 Electric Pallet Jack – How to Operate Safely – Part 2 (A Quick List) - MOBILE INDUSTRIES INC. :: Material Handling Tranport, Lift and Warehouse Equipment. Do you consider your safety and that of your team important? Of course you do! If you missed Part 1, you can view it HERE. If not, let’s continue. Do know where you’re going? Examine the route and make sure it’s clear of any obstructions or hazards that may impede or make the transport unsafe. Do bring the load off of the ground a few feet before moving and going to the drop spot. Make sure you come to a complete stop before lowering the pallet and dropping the load. To allow for better visibility which lowers the possibility of an accidental collision, operate the pallet jack so that you’re walking ahead and just to the side. If walking behind the unit is the only feasible way, ensure you use caution and have both of your hands on the controls. No matter the orientation of operation, in front or behind, use a normal walking speed when moving loads. Remain attentive and watchful for other vehicles and people. Keep in mind that the forks stick out beyond the pallet so exercise added caution when approaching objects ahead of you. Always lower your forks to the ground when parking. To prevent unauthorized use, if you have to leave the unit and it’s going to be out of site, disconnect the battery or, if it has one, remove the key. When parking, be certain to keep it from blocking any exits, aisles or emergency equipment. To prevent the load from tipping or falling, always moving straight up and down the incline and never on an angle. Make certain that the pallet truck and load is as stable as possible by always keeping your load uphill when moving up and down a slope. While on a slope, never stand in front of the walkie truck. Stay to the side of the unit. Is caution being used at all time? Are the trailer’s brakes engaged and the wheels chocked? Are the dock boards and bridge plates of sufficient capacity, in good condition and secure to the dock and trailer? Is a jack stand being used if the cab isn’t supporting the trailer? Has the trailer floor been inspect for and free of rotting, holes, cracks or other hazards that may make the shipment integrity at risk?